Do you like brown polish? Does it change your mind if it's bronze? Check out Finger Paints Bronze Sculpture. 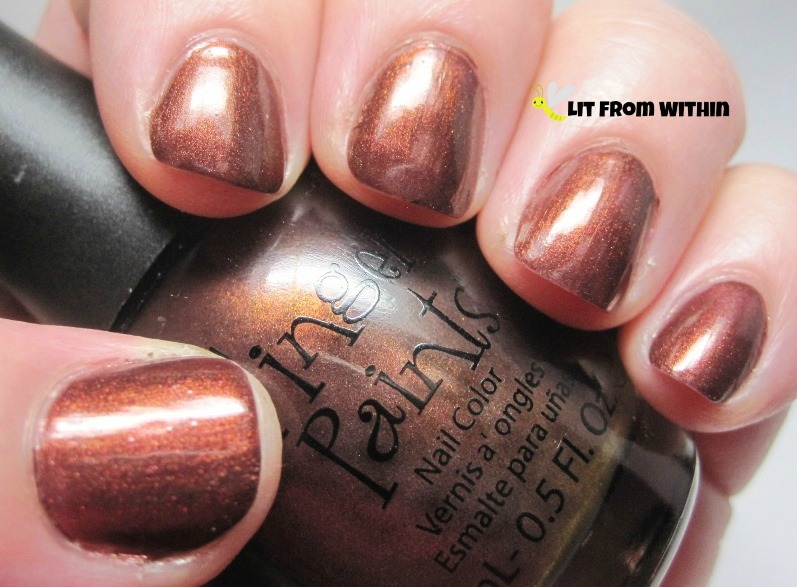 That reddish-gold shimmer just makes this polish glow. I seriously dig it. 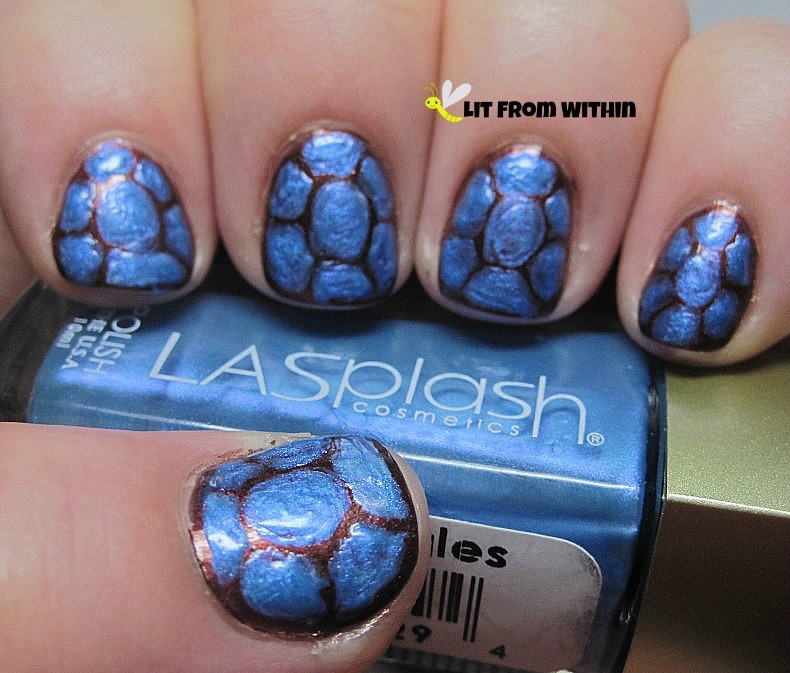 I saw Raggio di Luna's Red Tortoiseshell nail art and I just absolutely loved it. She has the perfect nail shape to totally pull it off, too. I thought I'd give it a try with some different colors. It's a terrible picture, but I wanted to give you some idea how I created the spacing and the shapes. 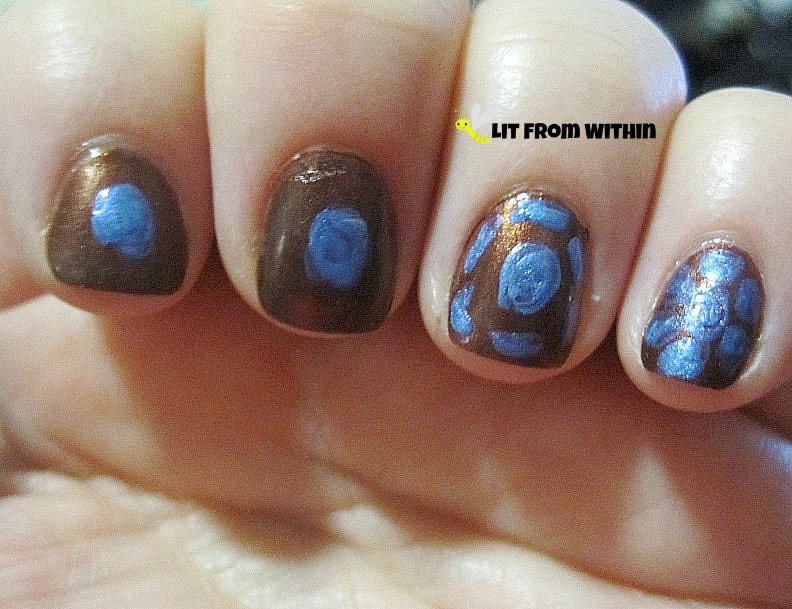 I'm so used to creating nail art by applying polish where I want the detail to go - it's a lot harder to create negative space - in this case, filling up almost all the space with blue and letting parts of the brown show through. I did have to cheat and touch up a little here and there, but overall, the brown is from the base coat. Topcoat really helps to smooth out all the brush strokes and help the shimmer from the bronze show through. 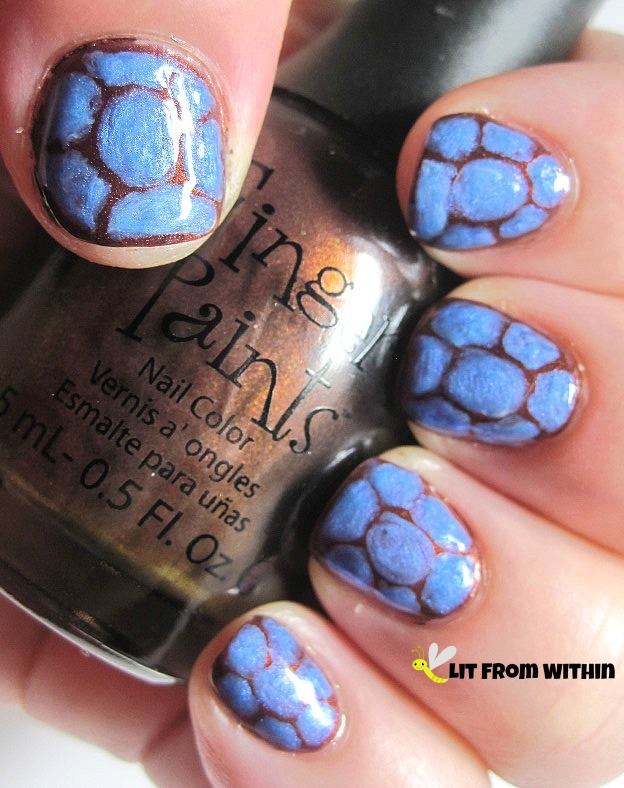 Do you think they look like turtle shells? 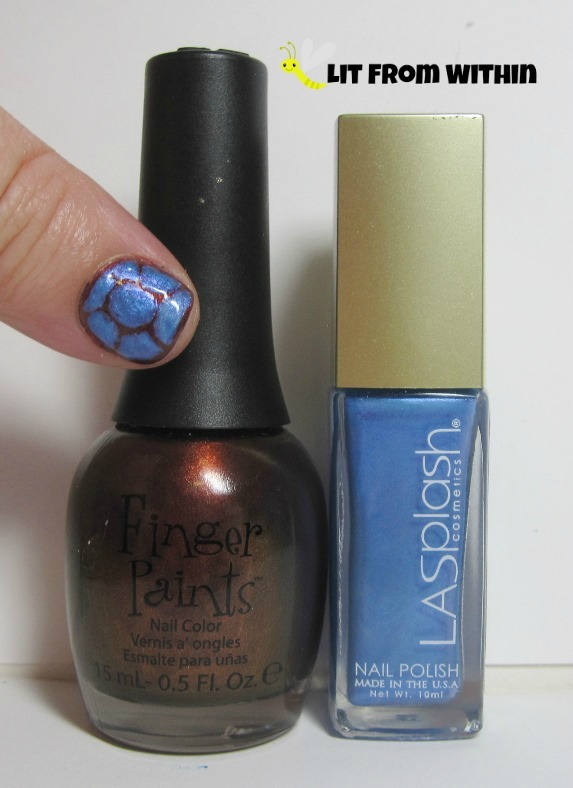 Bottle shot: Finger Paints Bronze Sculpture, and LA Splash Ocean Splash. I've created some nail art with tape that uses the negative space, but this is one of the few times I've painted over almost all the nail and left just the outline behind. Maybe it would have been easier to paint the blue first and then paint in the brown, but I don't think it would look as organic. How would you do it? Today's post is brought to you by my stubbornness and inability to paint a rose. I have done stickers, and blobs, and other permutations, trying and trying again. Today's version is inspired by a blog post from Kerruticles, who got the idea from Gemma Lambert. 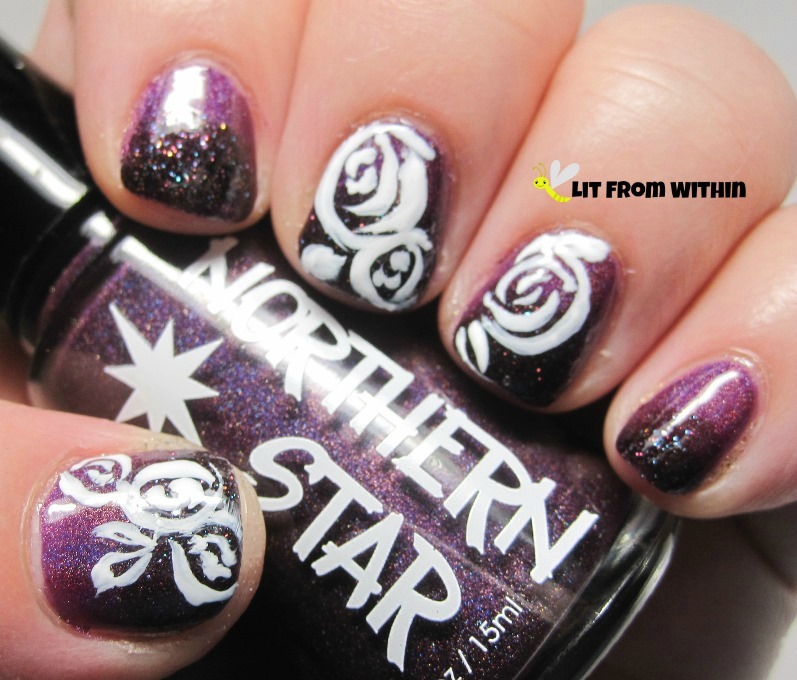 I use Finger Paints Winter Chill, a blackish-purple textured glitter to make a pseudo-gradient on the tips. I used my white striper to make these curved lines in roughly rose-like shapes. Squint your eyes and turn your head slightly to the right. Do you see them? 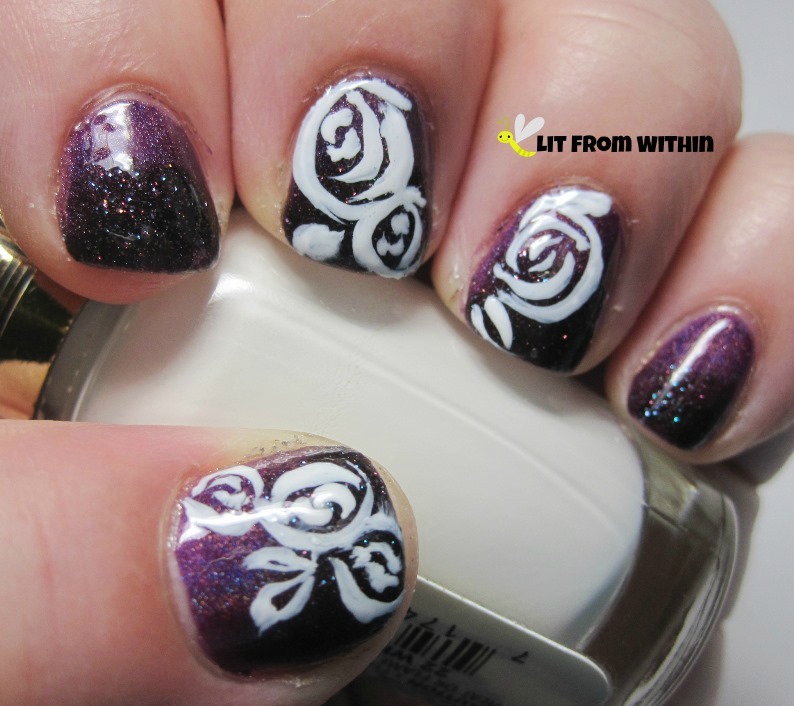 I can never quite get the correct overlap of the lines to mimic the rose petals. I look at the tutorial, I watch, re-watch, and pause the video.. I think I've got it, and then it just doesn't look the same when I do it. 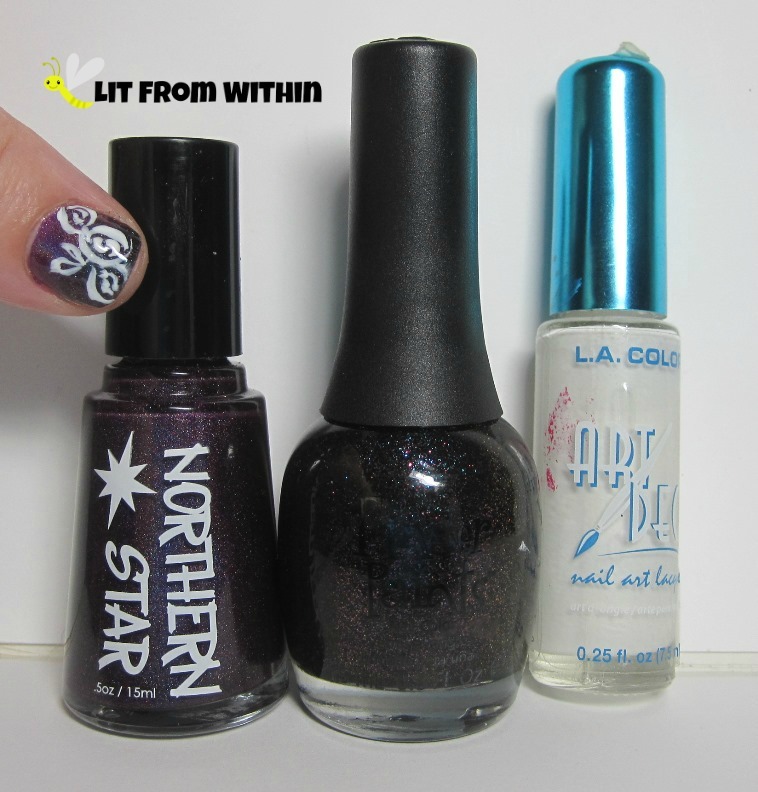 Bottle shot: Northern Star Polish Yummy Plummy, Finger Paints Winter Chill, and a white striper. I will say, though, that these are probably the closest I've gotten! Some of you will see commas, some of you will see white Skettios floating in a purple gravy. A rare few of you with vision will see the roses, and will help keep the dream alive. Well, we made it. 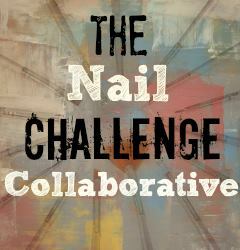 Today is the last 'summer' challenge entry for this month's NCC challenge! Whew! 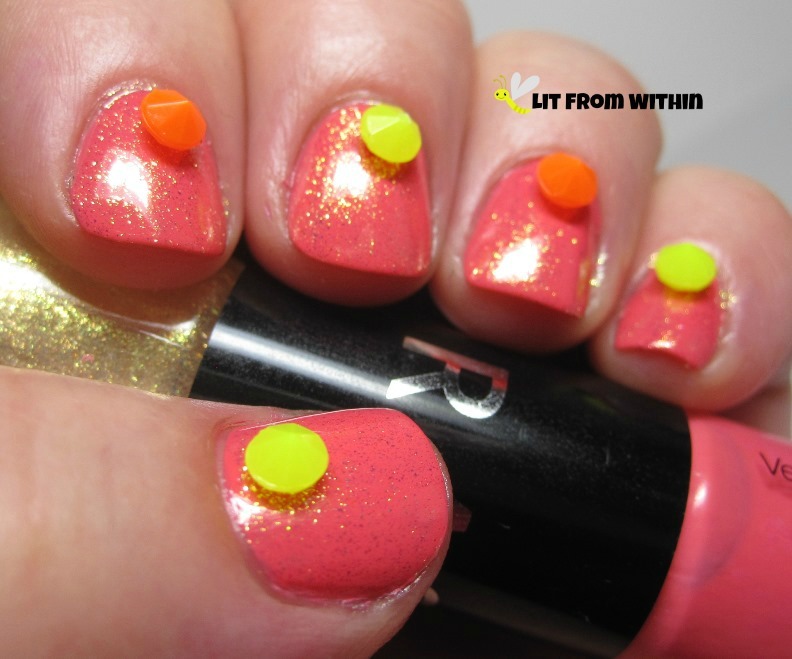 And, we're going out with a bang - of neon! 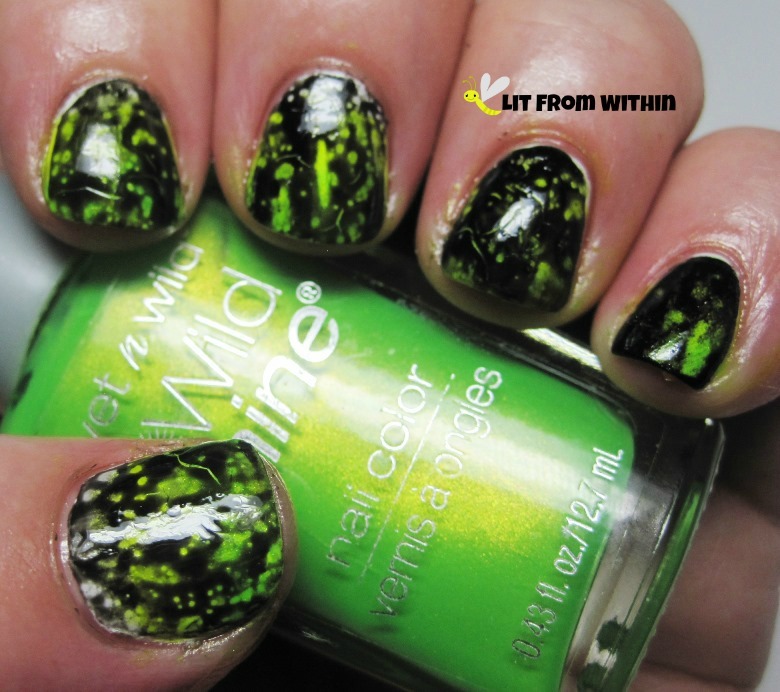 I used Wet 'n Wild Pin 'Em Slater over one coat of Revlon Spirit. This yellow is one of the best yellows, never mind neons, I've ever used. No streaking, clear color, great pigmentation. 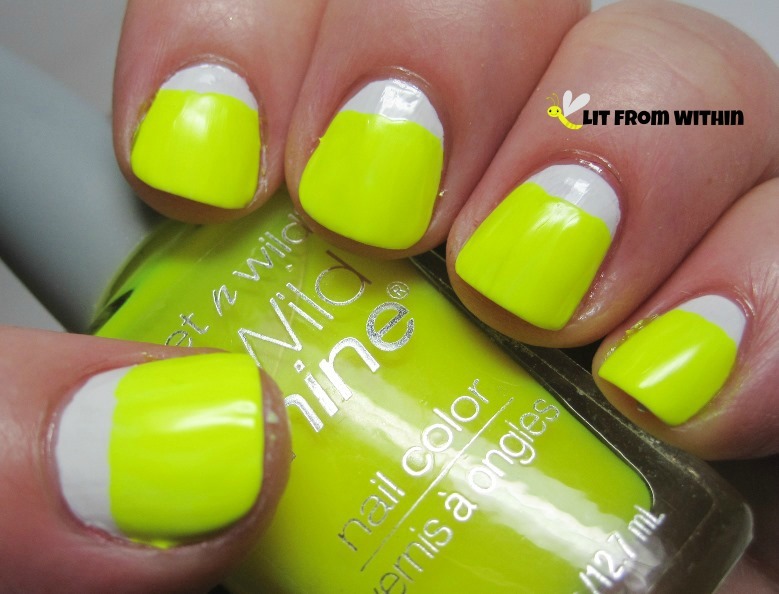 And it's BRIGHT, especially over a white, as most neons are intended to be worn. 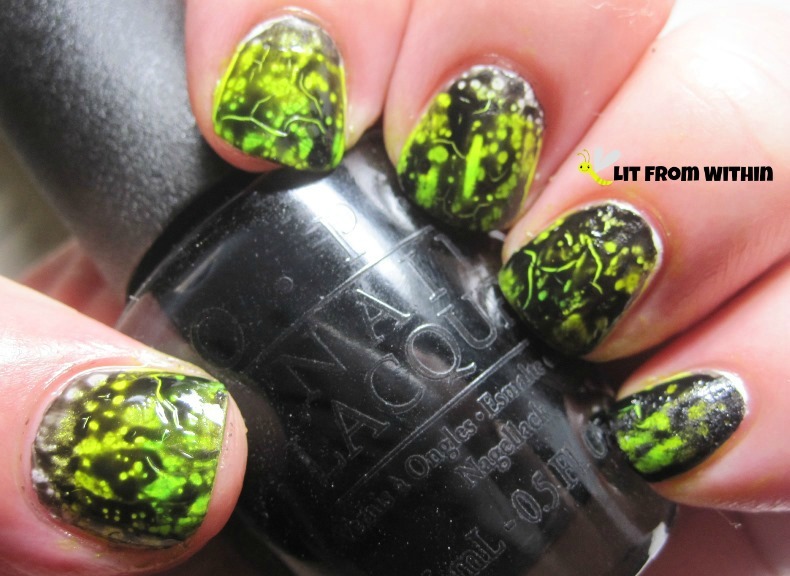 From the same Wet 'n Wild collection, I sponged on Nerd-Alert: Screech as a gradient. I wasn't too thrilled with my gradient attempt. Aside from the watermarble, I think the straight-up gradient has me stymied the most. I keep practicing, though! In an attempt to hide my gradient suckitude, I decided to pull out an old favorite - OPI Black Spotted. I had some application problems, though, which resulted in cracking as well as spotting. Of course, I could just pretend it was totally on purpose. I'm sneakily bringing crackles back. Don't be a hater. I do love how the neons look from behind the black, though. I also dig how the yellow shimmer in Nerd-Alert: Screech plays so nicely with Pin 'Em Slater. 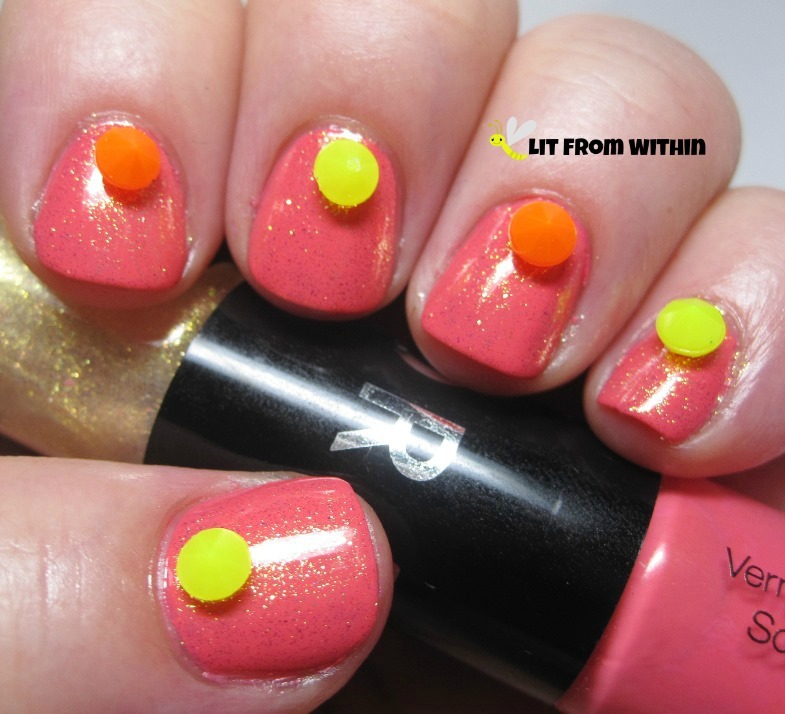 Do you think neons will be big again this summer? Are you ready for whatever new trend this summer brings? 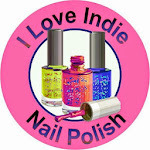 I'm involved in a big giveaway for The Lacquered Landlubber's blogaversary! 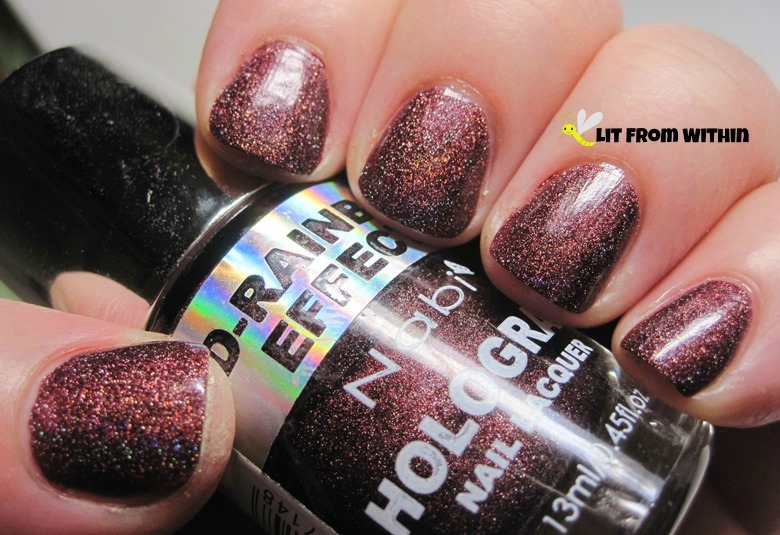 I'm sponsoring a topper-stravaganza prize with glitters, flakies, and a CND shimmer! Good luck! Can you believe this is the last few days of February? I have 2 more NCC posts to do - one more, after this one. It's a race to the finish line! Still not quite feeling like summer, but I do have the A/C on in the house already. Florida heats up fast! 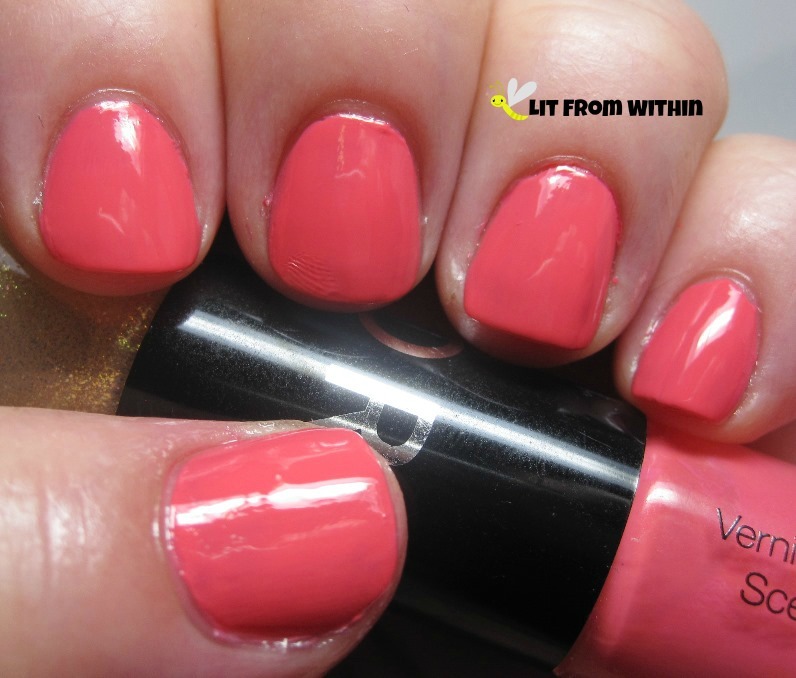 I start this 'summer' mani with a very summery almost-neon coral - the coral side of the Sephora duo Grapefruit. If this wasn't one coat, it was close. 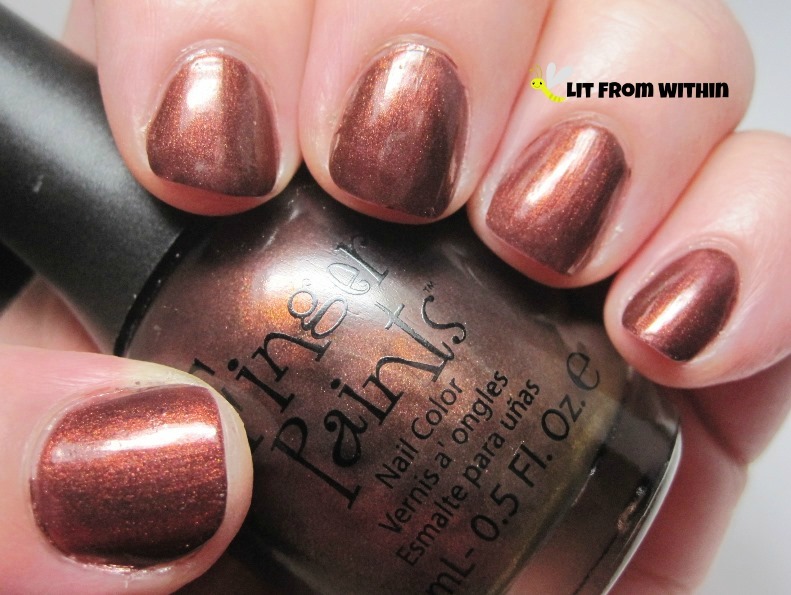 Great formula on this polish! 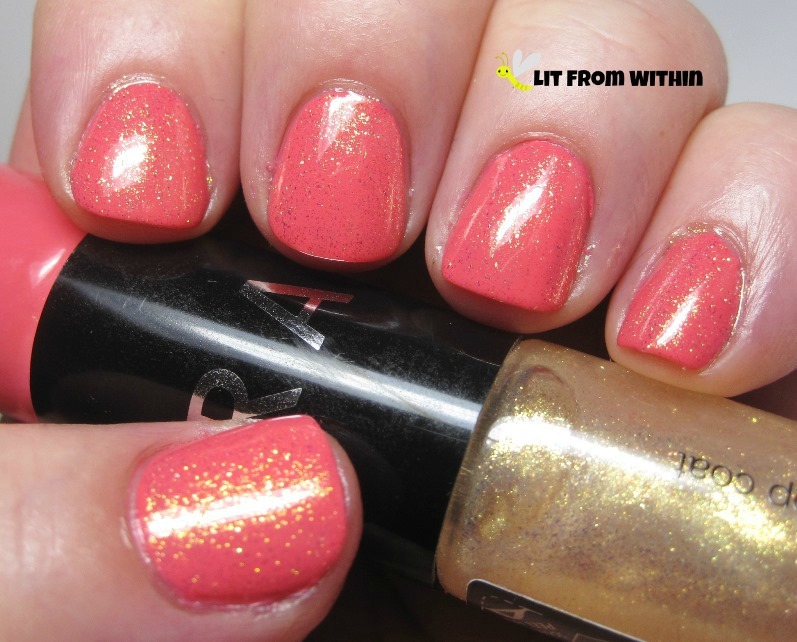 I loved the coral, and I loved the gold shimmer, too! This is one coat - I'd bet it could be built to opaque-ness if you really wanted. The coverage is fantastic. I suspect that these polishes at one time might have smelled like grapefruit, but if there was any scent, I couldn't really tell. I bought these neon studs from Winstonia. Well, I thought they were like flat, metal neon-colored studs. Boy, was I in for a surprise. They're practically balls! There's no way I could have worn these for any longer than it took to do the photographs. These are utterly ridiculous! They're like tops. I'd probably like them better if they *were* tops, then at least they'd spin. 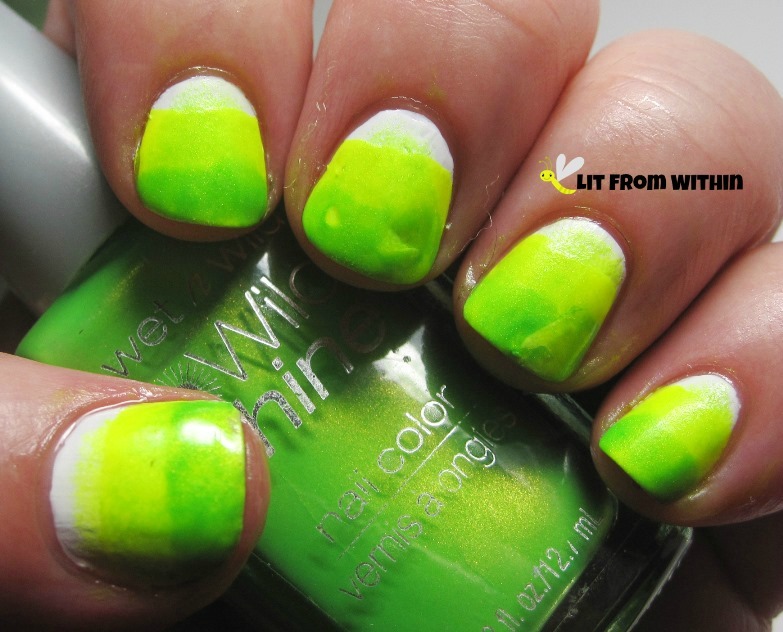 Well, they're certainly good for a laugh, and for a summery neon vibe. What do you think of these neon mushrooms? I should have stopped with the gold glitter... lol! 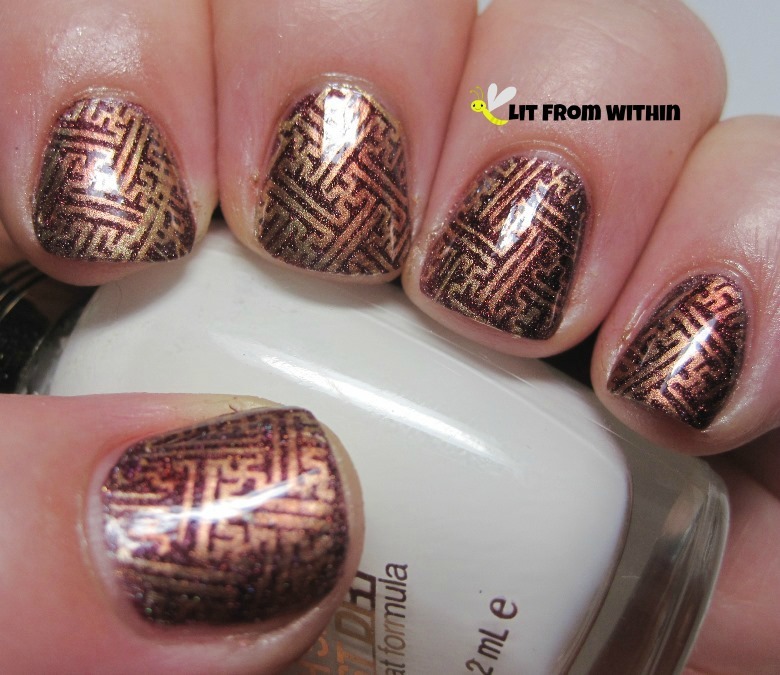 Today's nail art was inspired by geometric nail art by The Nailasaurus. Nobody does nub nail art like Sammy. I really love the shape of her nails, and her art is always so clean. Mine is definitely the lazy girl version! 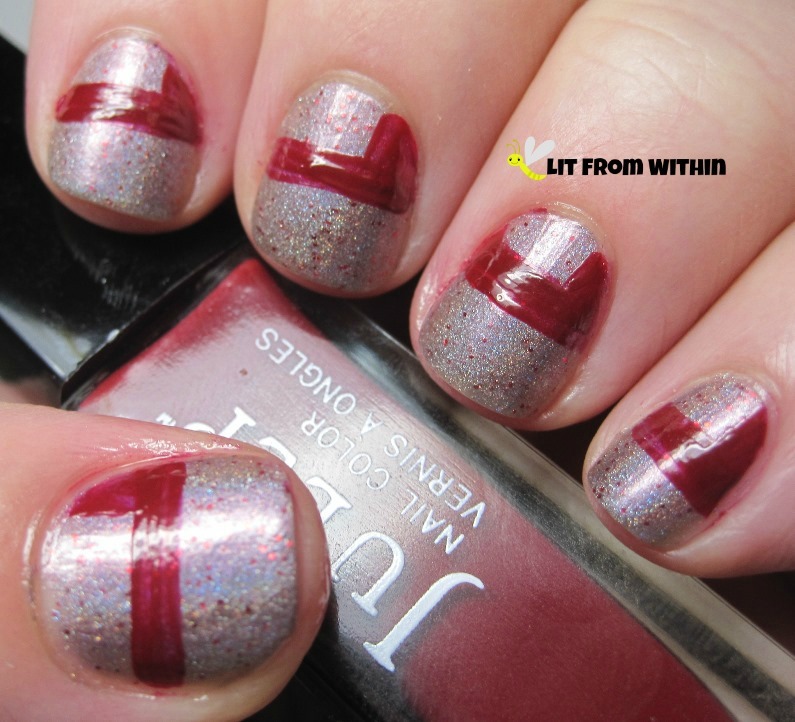 I started the look with Cameo Colors Lacquer Darling Nikki, a purple holo with red glitters. I really thought it was a red polish at first! It's pretty unique in my stash, and I really like it. If I had used tape, this part would be cleaner, but that's why this is the lazy girl version. This is Julep Anisa, a blood-red creme. This part is where Sammy's nail art looks so awesome - because her nails look so perfectly square at the bottom, the stripes look so much sharper. No matter how hard I try, I can't square mine off. I don't like the pointy edges, for one. Pointy things = owie. 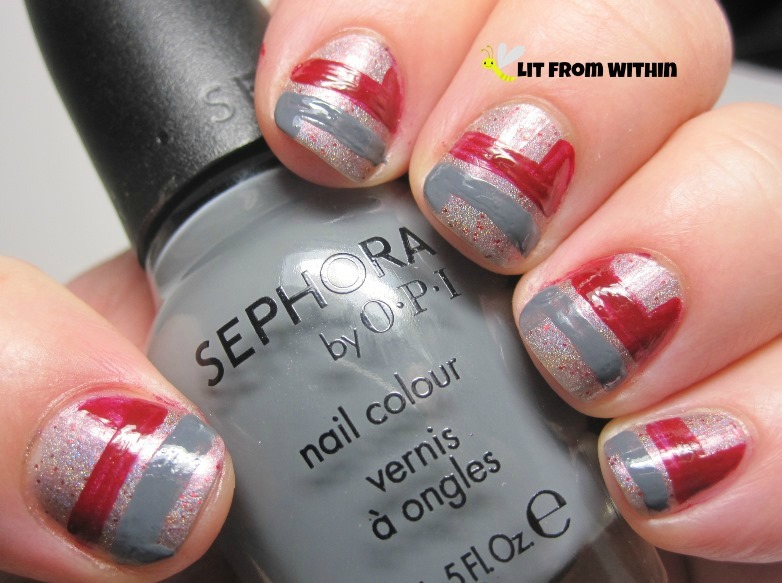 Sephora by OPI Break a Leg Warmer is a pretty grey that I love with both the purple and the red, and I think really brings all the colors together. 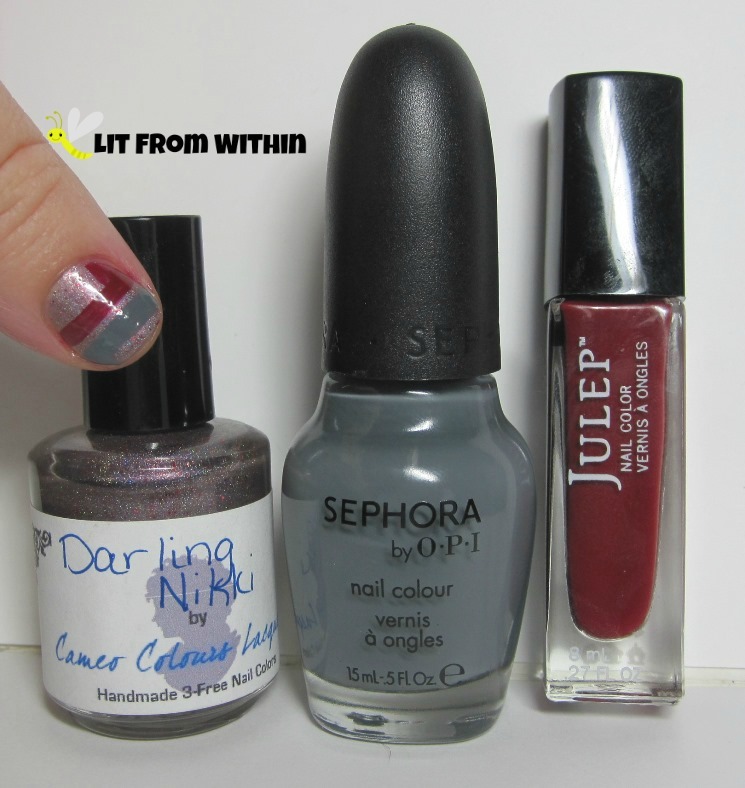 Bottle Shot: Cameo Colors Lacquer Darling Nikki, Sephora by OPI Break a Leg Warmer, and Julep Anisa. 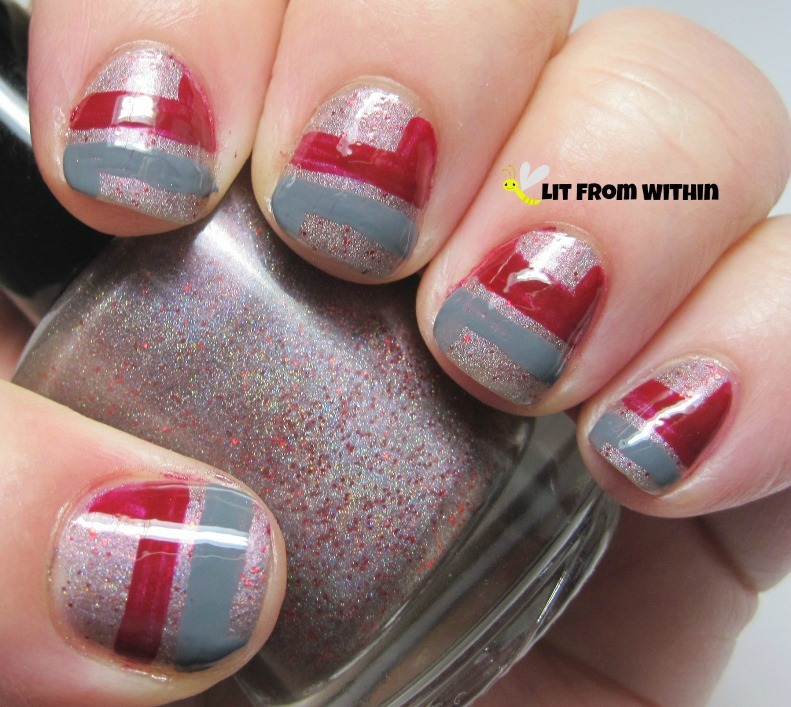 I love stripes in nail art! What do you think of this version? 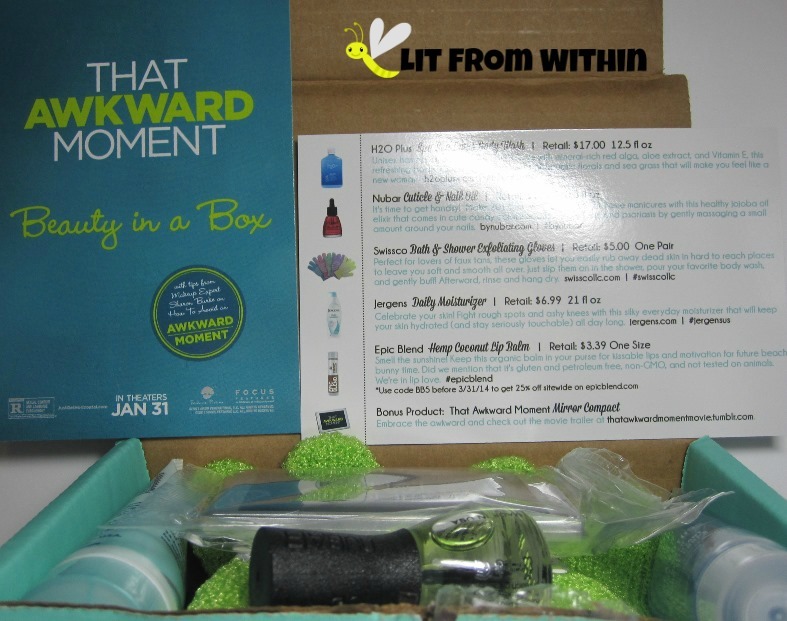 It's an awkard moment.. um, I mean, that's the theme of this month's Beauty Box 5 - the movie, That Awkward Moment. I signed up for a subscription to Beauty Box 5 in February, and when they found out I was a blogger, they sent me January's box, too. Of course, they sent January's box to a bunch of people as a promotion to sign up in February, so I'm not suffering under any delusions of grandeur. I love oils, I'm completely obsessed with hair, skin, cuticle - any kind of oil. This Nubar Vanilla cuticle oil smells nice, and absorbs relatively quickly. I like it! Another lotion sample, and not even an exotic one - just Jergens Daily Moisture lotion. We all have a bottle of Jergens somewhere in the house, right? Or in our parents' or grandparents' house. Nothing special about this sample - no interesting fragrance, no special formulation, just good ol' lotion. Works fine. 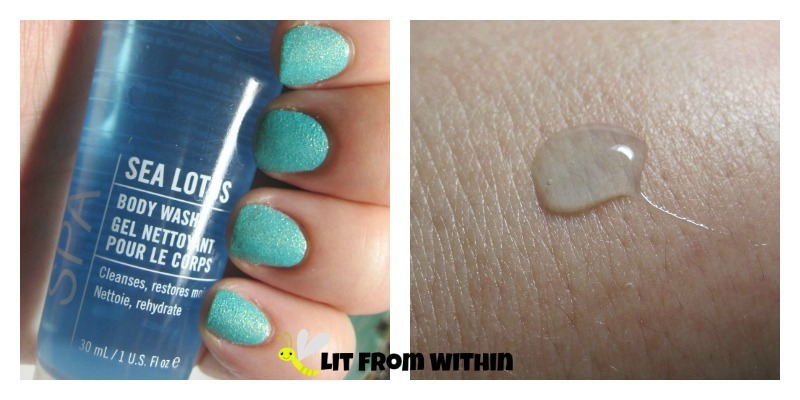 I really enjoyed this sample of SPA H20+ Sea Lotus Body Wash! It smells incredible - like the sea, like a spa, like someplace relaxing with hammocks. I want more. Sub boxes love lip balm! At least it's not another chapstick. 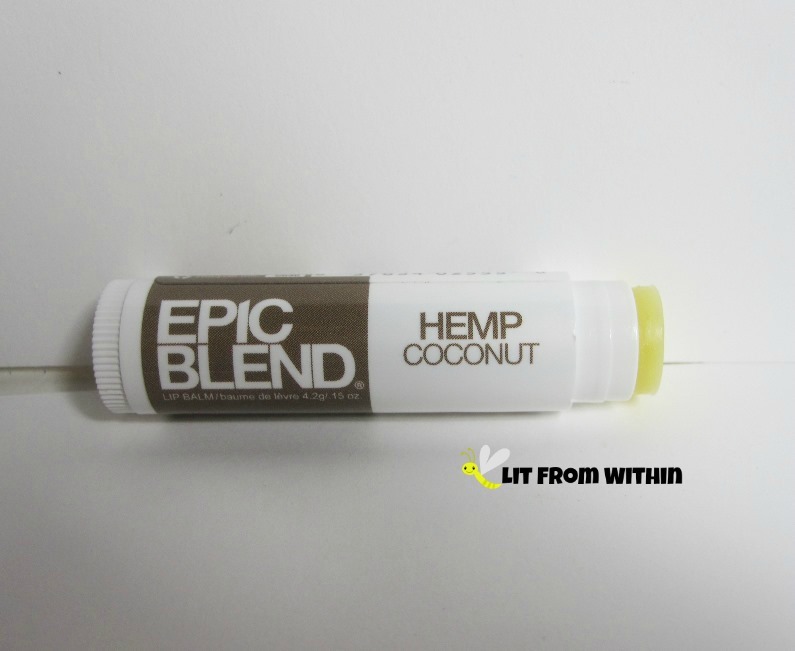 I actually like this Epic Blend Hemp Coconut lip balm. It's pretty slick, and feels moisturizing. I wish it were a little more coconutty, and a little less hemp-y, though. 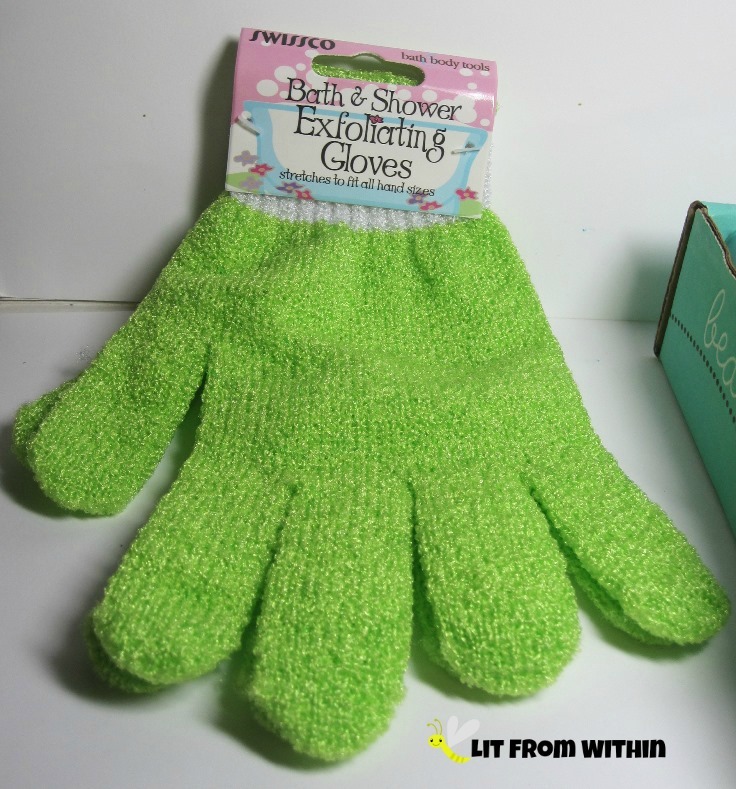 I was pretty excited about these Twistco Bath & Shower Exfoliating Gloves. I have one from Sephora, which I like, so I was hoping these would be as good. I should say, even the ones from Sephora, I don't like wearing it as a glove. For some reason, it's just too much work to put a glove on in the shower. The major pro of this glove is that it's washable. I can't stand using the plastic loofahs because they harbor a million germs - and I'm no germaphobe. I just think it's icky. I feel like these are more sanitary. The cons - too scratchy and rough. The Sephora glove has a side that's smooth and one that's rough. This one is alllll rough. No escape. Also, I wish they'd put a tab on the cuff for hanging it up to dry. The box also included a branded Compact mirror with the movie logo. It's cute, thin, and very lightweight. I thought it would be fun to model a polish color that matched the box. This did NOT come in the box - it's one I purchased myself. This lovely polish is Sinful Colors Crystal Crush Treasure Chest, a turquoise texture with a gold shimmer. So, not everything was a winner for me, but that's how sub boxes usually go. For the price, though, it was absolutely worth it. I really loved the shower gel - it's completely unique to anything I've tried. 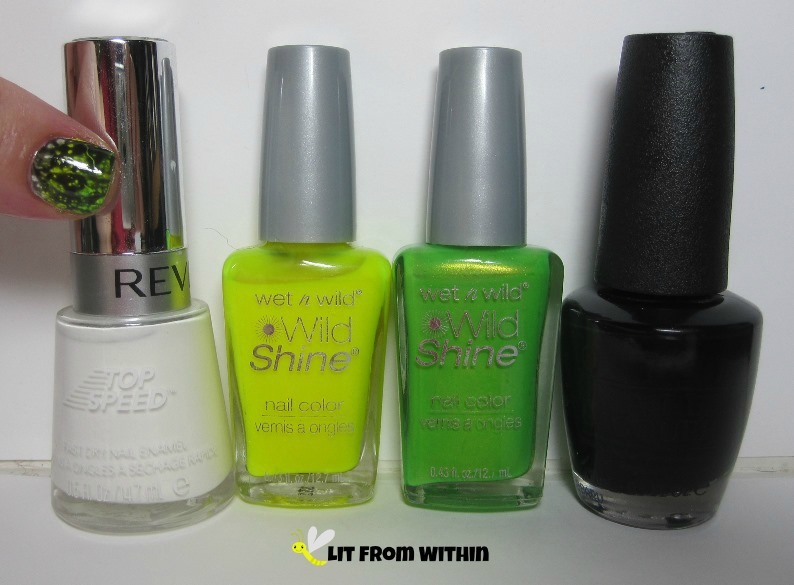 The cuticle oil was nice, and the other products were at least useful. If you're interested in learning more about Beauty Box 5, they can be found on Facebook, or their website. Today's stamping challenge was to use a plate whose number ended in '2'. It was kinda fun to go through a bunch of plates and just choose something I liked. I bought a bunch of Nabi holos a while ago from a seller on Ebay, tried a few, and the rest have sat around in the mountain of untrieds. I picked Tawny from the pile and fell in love. 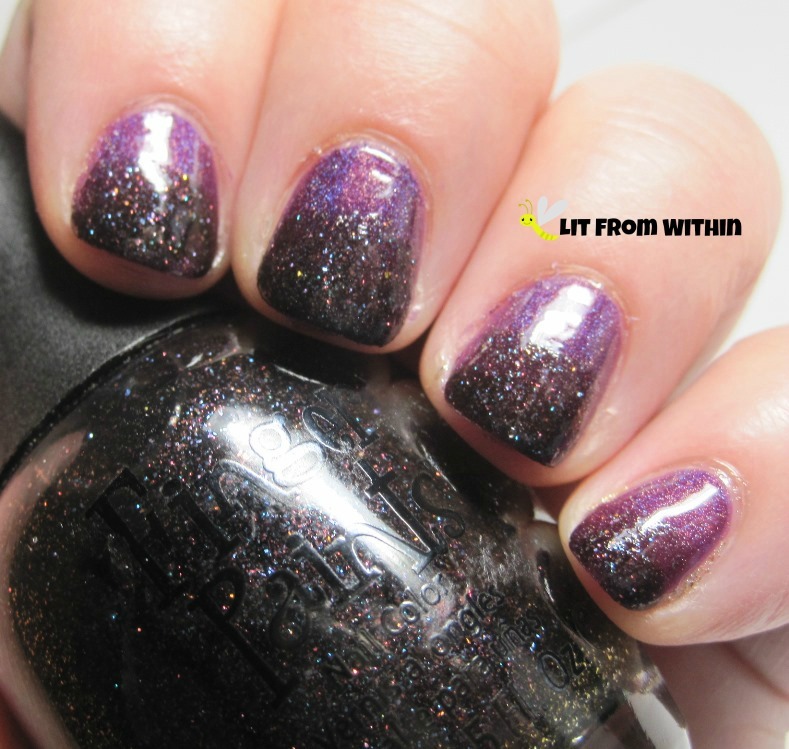 Even though these bottles are very similar to the Layla Holographics, these polishes are nothing alike. 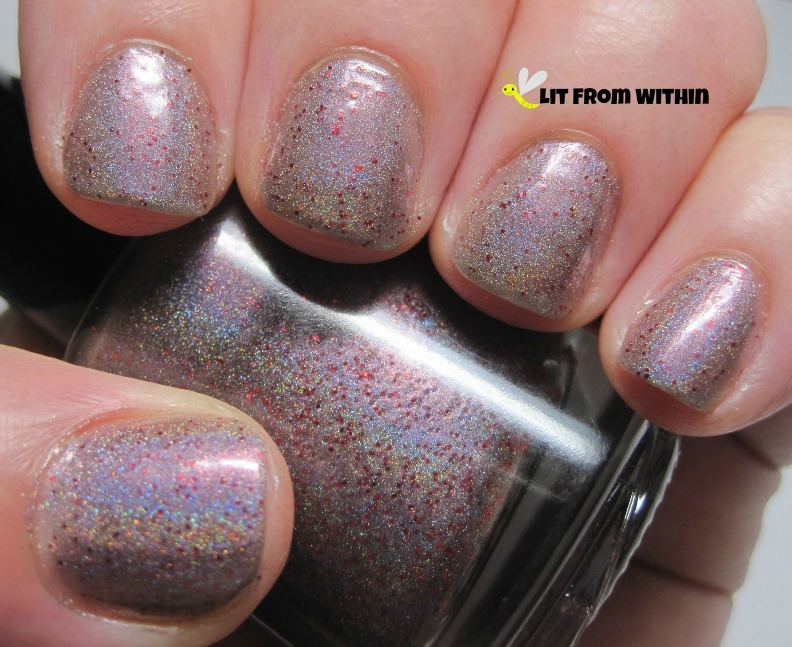 Laylas have an incredible mirror holo, but are super finicky and look best over an aqua base. Nabis are more of a tightly scattered holo. They can drag if you don't let the layers dry, but they're not finicky. I'm so in love with this rich wine color. 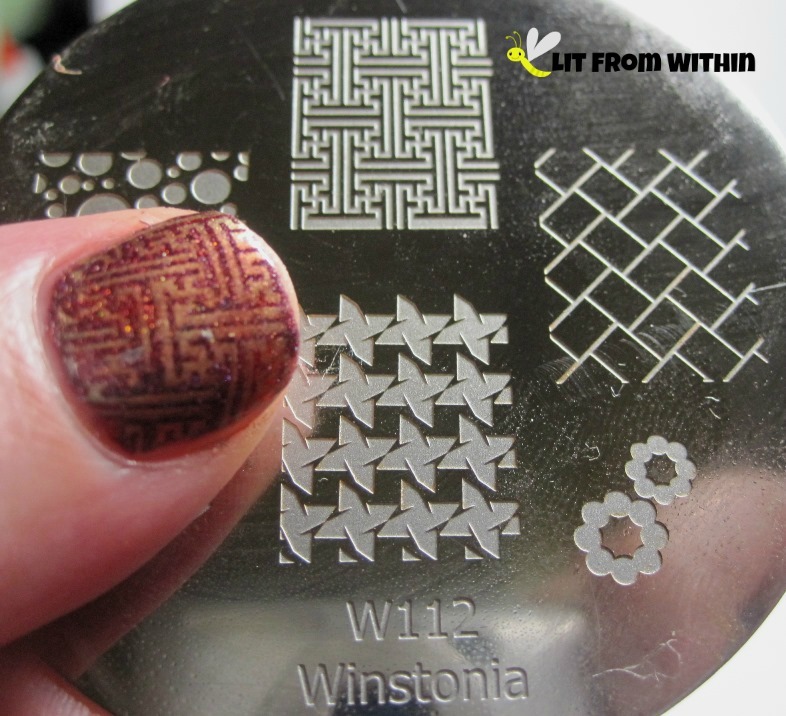 I really liked this pattern on Winstonia W112. At the time, I thought it looked a little like a circuit board. Now, I'm thinking more Greek-themed. 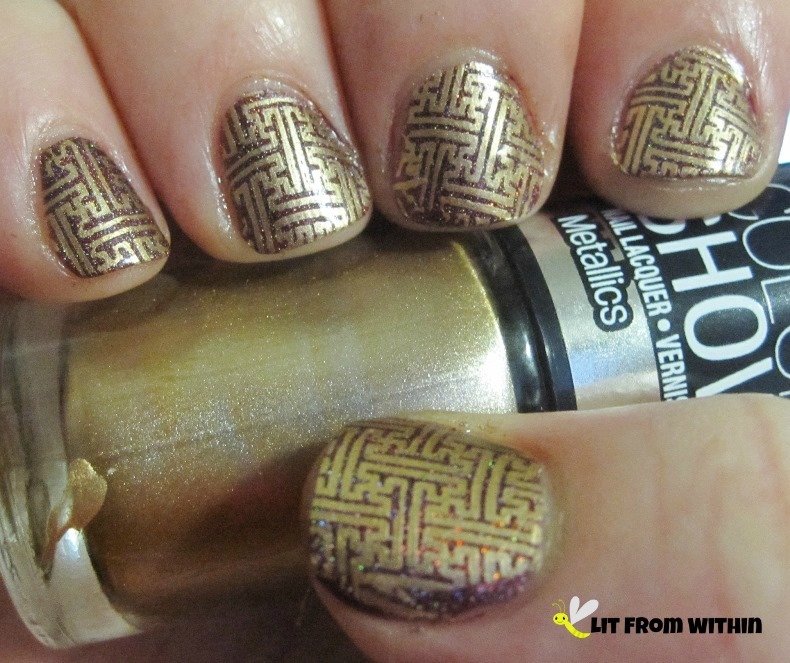 I used Maybelline Bold Gold to stamp with. It's one of my fave stamping polishes, and I was so stoked to find a couple of bottles on clearance at Target this past week! It was like Christmas came early this year. But wait, you say. That doesn't look gold. It looks reddish. Well, Tawny bled through the stamp when I applied top coat. It was an unexpected, but quite welcome effect! I think it's so cool, and I couldn't have planned it any better. I loved it so much, I had to do the other hand. 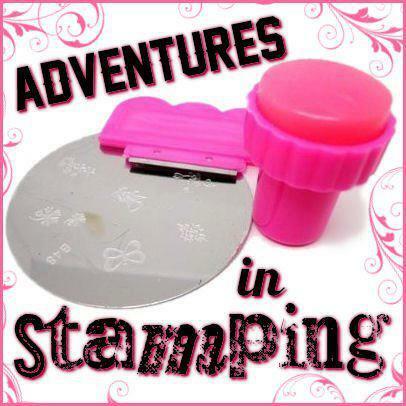 Here's what it looks like right after the stamp is applied, before it has a chance to bleed. Sooo different! I took this pix much later. Look at how both stamps have turned reddish as Tawny bled through the gold. So cool. 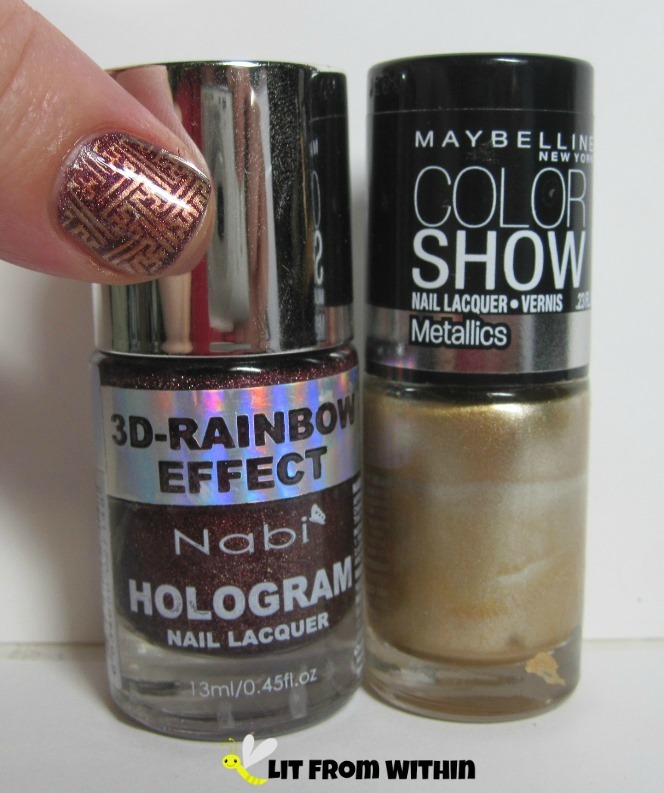 Bottle shot: Nabi Tawny, and Maybelline Bold Gold. Have you ever had a happy accident like this, where the final result wasn't what you thought it would be, but it was so much better? I have a Simple, Smoldering, Sultry look for your this Saturday. Take a gander at this gorgeous burgundy shimmer - Zoya Kalista. 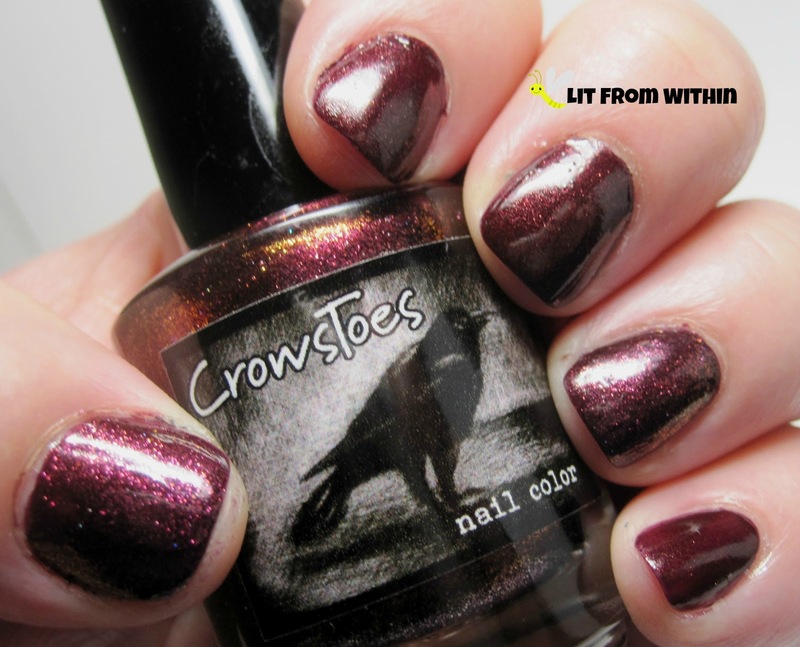 On my thumb and ring finger, I accented with CrowsToes Hellhound. 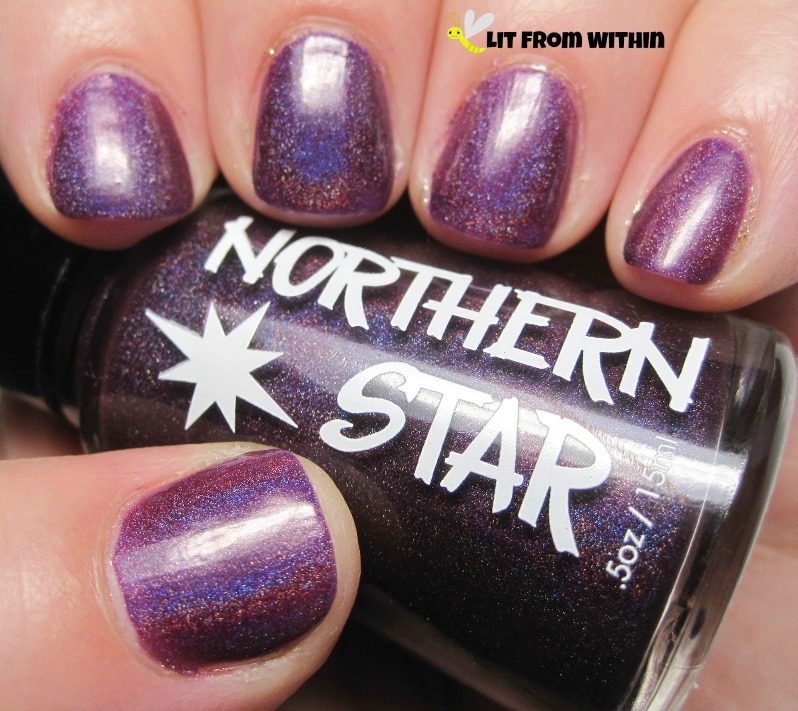 It looks like they have the same base color, but Hellhound has a fuchsia shimmer and a slight gold duochrome, so it changes as my hands move and the light hits it from different angles. The shimmer is incredible! 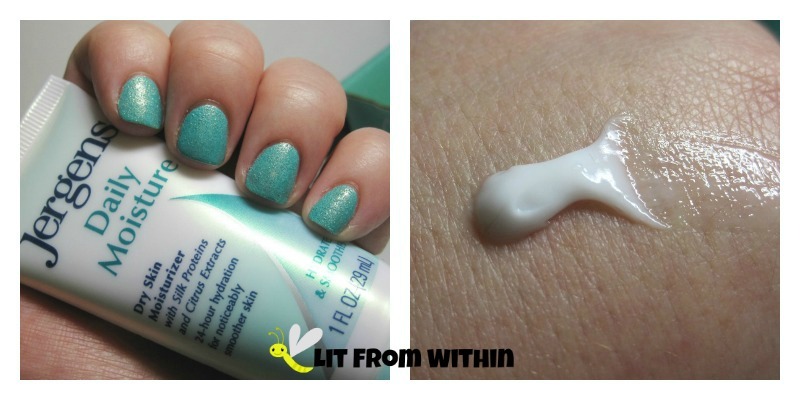 I love it in both polishes, actually, even though it is more subtle in Kalista. Oops, forgot to take a bottle shot! 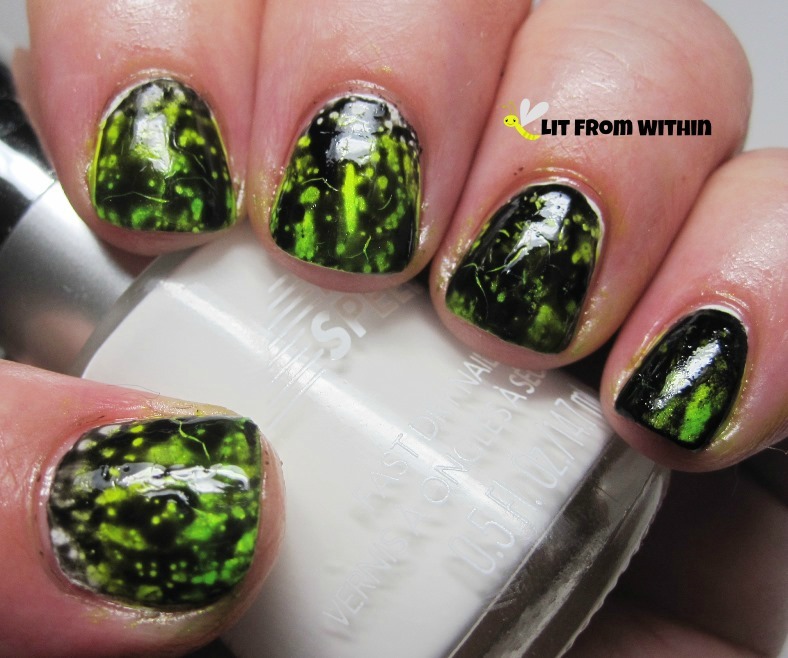 Do you like your accent nails to be more pronounced, or would you wear something like this where the difference was really only noticeable in a certain light?